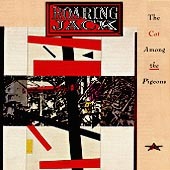 Here is a track-by-track analysis of Roaring Jack's first album-length release, The Cat Among the Pigeons. It was written by singer-guitarist Alistair Hulett and lead guitarist Rab Mannell just before the album's release. It was written expressly for the Spring 1988 issue of Fiddlestix, the Fairport Convention fanzine edited by Michael Hunter. Our copious thanks to Michael for uncovering this article and for permitting us to reproduce it. Three years ago in the inner city wastelands of Newtown, Sydney, the idea of Roaring Jack was hatched over copious jars of Dr Cooper’s murky elixir. A celtic folk band, spiked, gelled and electrified using the traditional forms and playing styles of Scots and Irish music to carry tales of class struggle and ordinary madness. Accordians would be required, mandolins and fiddles to boot, as well as the usual batterie of loud guitars and drums. Like every folk rock band before them, their debt to Fairport’s Liege and Lief goes without saying. An equal acknowledgement is owed to the Clash, who caused a similar catharsis in folk circles with ‘English Civil War’. Folk wielded with a punk attitude that began the new folk wave that includes Billy Bragg, the Pogues and in Australia Weddings Parties Anything and Roaring Jack themselves. The Cat Among the Pigeons is their follow up to a debut mini-album Street Celtabillity. The album was recorded at Sydney’s Studio 301, produced by their good mate Tony Espie. Believing the band is at its best live and intoxicated, Tony recorded the drums and electric instruments altogether going for first takes whenever possible. The acoustic instruments were overdubbed later to avoid microphone spillage. The end result is a fine balance between spontaneity and clarity. What follows is a track by track run down on The Cat Among the Pigeons. We begin in the time honoured fashion, with a dram of the cratur. ’Uisge Beatha’ is gaelic for whisky, the water of life, no less. Between verses Rab and Steph play a fine old celtic tune on guitar and accordian called ‘Glen Rhinries’. On now to deeper waters with a few songs about acts of foolishness we ourselves have committed in the name of human love. ’Love in the Modern Age’ is about confusing genuine affinity with an alliance based on the notion of getting ahead in the rat race. Rab’s guitar solo owes much to years of spotty adolescence playing Hank Marvin guitar lines in his bedroom on a cricket bat. ’Lights of Sydney Town’ begins with a tune known in Ireland as ‘Planxty George Brabasham’ and in Scotland as ‘Twa Bonnie Maidens’. After that it’s a boots and all celtabilly slam out with drummer Steve Thompson overlaying a clack track on colonial Australia’s greatest contribution to the world of music, the lagerphone. Deaths in police custody are all too frequent in our country. Aboriginal people and ethnic minorities are usually on the receiving end of it and the majority by its silence displays its indifference. ’The Day That the Boys Came Down’ is set to a bluesy shuffle with a music hall feel to the tune. ‘The Baron of Brackley’ on a dog day afternoon. ’The Lass Behind the Beertaps’ uses an old Scots Jacobite tune called ‘Who’ll Be King but Charlie’. We’ve always liked the tune but kings by any name, Charlie included, bog us right off. Save the best and piss off the rest, we thought, so we nicked the tune and wrote a new set of words. The reference in the chorus to the quare chap has nothing to do with sexual preference. Quare is Irish slang for peculiar. We conclude these matters of the heart with Steph’s lovely song ‘Go Leave’. A farewell, not to the notion of lasting love, but to the belief that anyone outside yourself can take responsibility for your own happiness. The tune in the middle is a Scots pipe tune called ‘The Battle of the Somme’, learned from the playing of Dave Swarbrick in the days of the Ian Campbell Soup Group. The first side ends with a song about the Highland Clearances. In the aftermath of the Clan Rebellion of 1745, the British ruling class launched an eviction program in the north of Scotland which decimated the highland population. Driven from their homes in the harshest of weathers, the clansfolk were forced to make their way to Glasgow, to be herded like cattle onto slave ships bound for British colonies. At the time the road from Inverness to Glasgow was known as the ‘Destitution Road’, hence the title of this song. The second side of the album is given over to class politics, specifically those of Australia. First up is a condensed history of the white invasion, the only completely acoustic track on the record, called ’The Swaggies Have All Waltzed Matilda Away’. Alistair’s guitar is tuned to a modal ‘C’ tuning C G C G C C, giving it a sparse drone-like quality. Considering the generous investment incentives and tax reductions corporations receive in Australia, it would be reasonable to assume they would do their share of belt tightening in hard times. As our man in this song ’Moving On’ discovered, such is seldom the case. Redundancy at the age of 52 isn’t much of an endorsement of the Quiet Achiever or the Big Australian. ’Playing For the Traffic’ carries on a similar theme. Old geezers picking through rubbish bins in the concrete canyons of commerce. The overlooked underbelly of uncaring capitalism. As a result of his dodgy Government’s policy of flogging off uranium to anyone who’ll buy it, Prime Minister Hawke has earned himself the nickname Yellowcake Bob. But then sacrificing principle for political expediency is nothing new to the A.L.P. ’The Thin Red Line’ is Roaring Jack’s considered opinion on the matter. ’The Cat Among the Pigeons’ is a set of celtic tunes prefaced by a short piece of acoustic ambience by the Roaring Jack Folk Orchestra, playing zither, guitar, dulcimer, whistle, accordian, cittern, fiddle and bodhran. Alistair rants for a bit about revolutionary socialism before the electric ensemble takes off with a medley of workers’ tunes from Brittany, America, Scotland and Ireland, with a jig nicked off Dave Pegg thrown in for good measure. The album ends, as their live set usually does too, with ’Lads of the B.L.F.’ The Builders’ Labourers Federation is a militant left wing union which was deregistered in 1986 for refusing to acknowledge any difference between industrial relations and class struggle. Although they are now an illegal organisation and constantly vilified in the Murdoch press, their members continue to fight for a fair deal for ordinary Australians. Roaring Jack raise a glass to the health of those and others like them who would dare to set the Cat Among the Pigeons. Steve Thompson – drums, bodhran, lagerphone.